This build prides itself on maximizing mobility and speed for fast and smooth clearing as well as having high DPS, survivability and versatility (6 jewel sockets). Daggers are the weapon of choice here for high crit as well as the ability to use whirling blades/shield charge for added mobility. To Vaal Pact, or not to Vaal Pact? Vaal Pact with CI/ES was awesome (that's why it got nerfed). With life-based builds, it becomes tolerable, and no longer as fun. Not having the ability to regen life can get very annoying in lab running and general gameplay. You can still opt for Vaal Pact if you wish to do so, but I personally found it very unnecessary. Vaal Pact comes in extremely useful versus bosses because it enables you to facetank them, and without Vaal Pact the fights become much more challenging. To me however, bosses comprise maybe 20% of the content, and I much rather focus on having a smoother gameplay experience For the other 80%. Why Warbringer and not Cloaked in Savagery? Dark Pact already gives a ton of damage, enough for us to leech more than the 6% we expend per cast. As such, I didn't find it necessary to get Cloaked in Savagery, especially when its only useful during combat. My gameplay style for this build is all about recovery which is independent of flasks, and Warbringer's 25% instarecovery for both the life and mana pools suits me very well. Use Earthquake or Sunder to level. I used Earthquake as its single target DPS is better than Sunder. Rely on cheap leveling uniques such as Limbsplit, Geofri's Baptism and eventually Marohi Erqi for quick leveling. I personally only switched from Earthquake to Dark Pact at level 68 (I used Earthquake to beat merciless lab) because Earthquake was clearing/killing things rapidly enough for my liking. This jewel provides a huge damage boost for a reasonably low price at the start of the game. It will be surpassed in terms of DPS and survivability by a good rare jewel later on, but it is useful to have at the start of the game. WARNING: getting 5 off-colours on Cherrubim's is going to be tough! 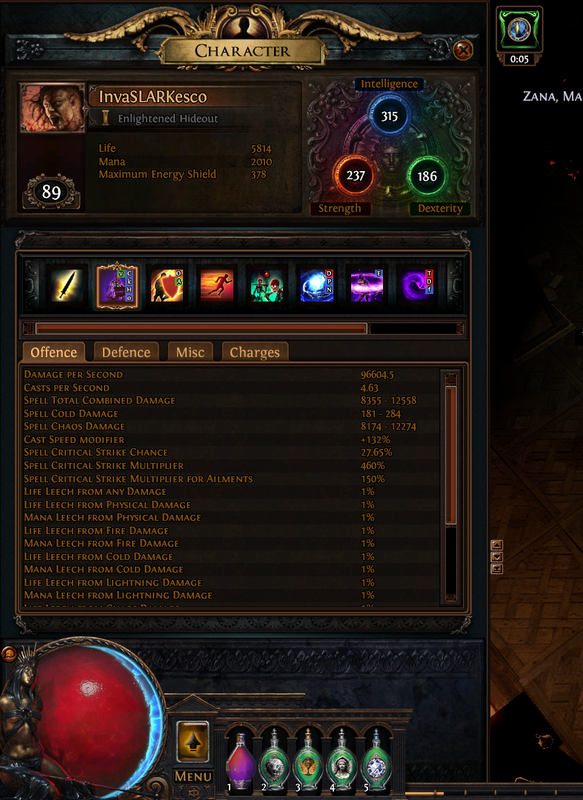 Leave this to the last for min-maxing purposes, and use the vorici socket method. It is not necessary for the build to function, but the crit and life bonus it provides, not to mention the insta life and mana leech when you crit makes this pair of gloves extremely desirable. Belt of the Deceiver, cheap and good. I have only seen such a jewel once however, and it sold for way above what I could afford. one step closer to acuity! Could have 10K life andn just a little less DPS with Kaoms. Another thing I disliked about crit was the orb casting. Wastes a small step to get charges that could be used to DPS them down. Anyway just think you'll find stacking chaos life and spell damage will come out on top. DPS wise. Convenience wise (ease of play). And EHP wise. Heya, I appreciate your input aim, but I do feel that what you've mentioned above is misleading. I Granted, it might have been my mistake to not have provided my gem links and stats in order to arrive at the above DPS, but your comparison was an unfair comparison to begin with. Keep in mind that I'm only level 89 and you're level 94. In addition, you have already maxed out your weapon DPS in terms of having a high rolled Pledge of Hands as well as having pretty sick gear for the rest of your slots whereas my gear (particularly dagger and shield) still has ample room for improvement. Another thing I disliked about crit was the orb casting. Wastes a small step to get charges that could be used to DPS them down. Its just a simple step that is fast, need only be done once per 7 seconds and provides me with both charges as well as the arcane surge bonus. I don't even need to do it versus regular mobs to be honest if I don't wish to, but it really isn't as difficult as you may think. Also, I find that having the option to use additional skills makes for more engaging and rewarding gameplay which simply right clicking and having only 2 active skills does not provide. Anyway just think you'll find stacking chaos life and spell damage will come out on top. DPS wise. Convenience wise (ease of play). And EHP wise. Nope, DPS-wise crit will always be better. The only main benefit of stacking chaos, life and spell damage will be improvement in survivability. Your EHP as non-crit non-MoM user is not going to be better than a crit-based MoM build for similar DPS output. Sacrificing 10% HP, you get a 17.5% DPS boost (which rises to 50% upon use of a diamond flask). Keep in mind that once you get crit multi mods on gear and jewels the DPS difference between crit vs non-crit will rise even further. Therefore, going non-crit doesn't win out crit in every single aspect. You just get more life, that's all, but your claim in the above quote is invalid. 1. I did consider going staff, but the mobility advantage from shield charge/whirling blades was too difficult to consider foregoing, and overall clear speed does depend on mobility after all. Lightning warp can also do the job, but there is still split delay when waiting to arrive at your destination. Nice, going to try this out. 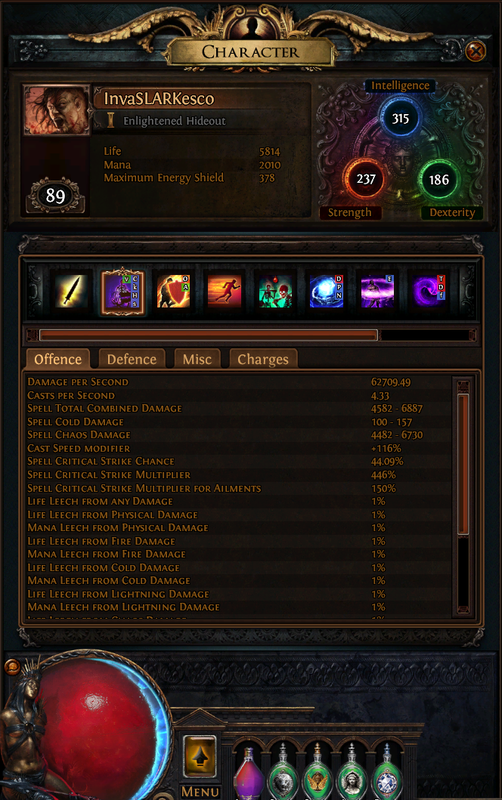 Tried a non-crit DP build but didn't like it as much see how this goes. which bandits did u go for? i actually ended up killing both as I couldn't decide between krait or alira. Alira gives higher dps with a nice bonus to res while Krait gives better clear speed and mobility coz of movement and attack speed. Oof, 5 blue coloring a Cherrubrim's is tough, how many chromes did that take? Did you use the Vorici jeweler method?